Chicken Caesar, a famous salad made from Parmesan cheese, cooked chicken, romaine lettuce and croutons with the dressing of your choice, is an impeccable dinner dish. The dressing can be made from pepper, olive oil, garlic and lemon juice. The versatility lay in its role as either an appetizer or a main entrée. But nowadays we want to have healthy diet, so the chicken caesar salad calories content becomes very vital. Here you will know the calories in a chicken Caesar salad and its other nutrition facts. When coupled with dressing, a grilled dinner-sized chicken caesar salad has about 590 calories. Using less dressing on the salad and less oil in the dressing could lower the caloric content. Besides, if you butter the bread before toast it and grill your chicken rather than use fried breaded chicken strips, you can lower the calories content in your salad. Major sources of fat in the salad stem from the Parmesean cheese and buttered crouton, which has saturated fats and will increase the bad cholesterol, LDL, level. Using olives or home-made olive oil increases heart-friendly unsaturated fats. 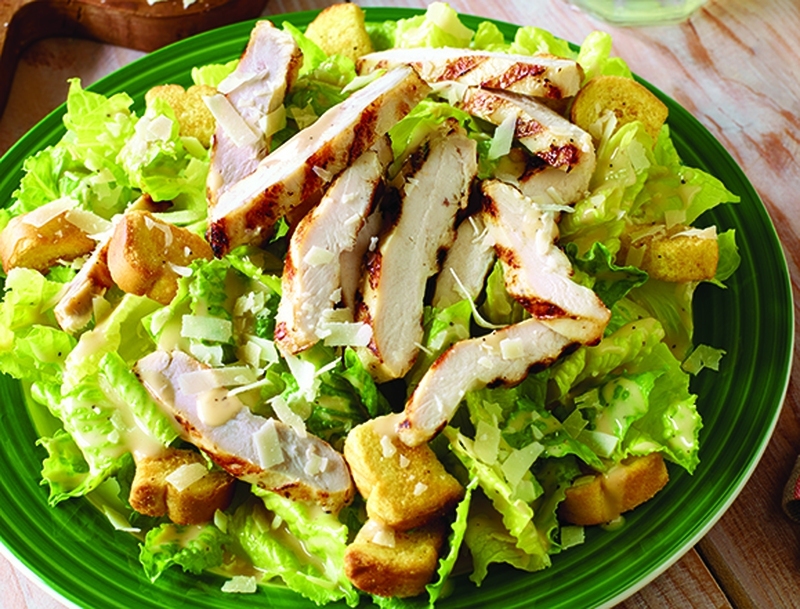 The romaine lettuce and grilled chicken have very little fat, lowering the amount of calories in chicken Caesar salad. Conversely, fried and breaded chicken have loads of it. Chicken Caesar salad contains anchovies, olives, Parmesan cheese and seasoned croutons, which are all rich in sodium. A Dietary Guidelines for Americans released in 2010 said although sodium is essential to our body, too much sodium can increase your risks of heart disease, kidney issues and even stroke. Bear in mind that a healthy adult needs no more than 2300mg sodium per day while a serving of 2 tsp. commercial salad dressing contains 363mg sodium. Besides, there are also vitamin B12, niacin, vitamin B3, dietary fiber, vitamin A, folate, calcium and potassium in chicken Caesar salad. Prepare the grill, coat the chicken with oil, salt and pepper as desired and grill the chicken until a nice brown. In a separate bowl, combine the lettuce and croutons and add the dressing. Toss the salad and place onto four different plates in equal portions. To make the curls, use a cheese consisting of at least 4 ounces and cut with a carrot peeler to create the curls. Take the chicken and cut into strips. Place over the salad. Finally, sprinkle the cheese curls and add the lemon wedge to the plate and serve. Enjoy!